As you might already know, I am in New York City right now attending the Red Carpet Premiere of War Horse and to view a special screening of Beauty and the Beast 3D. Beauty and the Beast is one of my most favorite Disney films, so I am delighted that it is returning to theatres in a new format that will appeal to a generation, and that will also bring in some of those nostalgic movie lovers who remember this great Disney classic from our own childhood. I think my daughter is still too young to see a film in 3D, but she already knows who Belle is, and has repeatedly been asking me to watch “Belle” on the “big TV”. In the near future, I hope to take her to her first theatre experience–and I am positive it will be a great Disney family film. 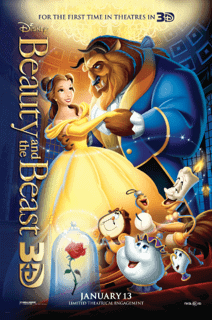 Remember to keep checking in on Simply Stacie for the latest coverage on Beauty and the Beast 3D and War Horse. For now, here is the first trailer for Beauty and the Beast 3D. Your Very Lucky Stacie !